Similar to the premiere in summer 2010, again the maximum visibility from the outside is most important. This is achieved by pasting the booth container and the container wall with motifs of the current print campaign. 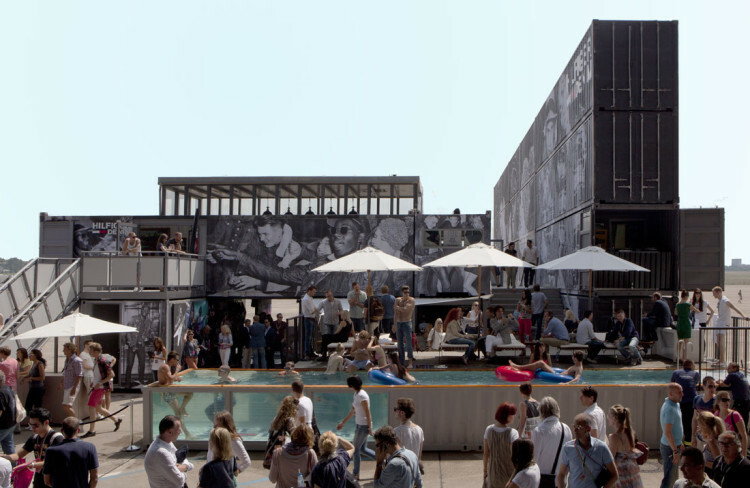 In addition, Hilfigers container booth opens up to the Denim Base of the main exhibition hall of the Bread & Butter with an open deck complemented by a container pool with glass walls. In 2010, the Amsterdam-based fashion label „Tommy Hilfiger“ has commissioned on the grounds of the former central airport in Berlin the design and implementation by us, their appearance at the fair called BREAD & BUTTER. Since „Tommy Hilfiger“ for some time was not present at fashion shows, therefore the construction must be most VISIBLE from far away staging with great radiance and attraction. The focus was on hospitality, and a meeting place was designed. The fashion collection was exhibited only sporadically and was presented to the customers at the newly introduced iPads.